Mr. Hatch cannot smile. He leads a colourless, ordered life, until one Valentine’s Day, he receives a candy-filled heart with a note that reads, “Somebody loves you.” Mr. Hatch’s world (and his frown) are turned upside down and then he does something he has never done before…he laughs! This heartwarming and award-winning show uses a creative and ever-surprising blend of live performance, puppetry and live music. Who is his secret admirer and will Mr. Hatch keep his new-found smile? Whatever the outcome, Somebody Loves You Mr. Hatch is sure to put a smile on your face. Watch the video below! 2016-2017 Jessie Richardson Theatre Award Winner for Outstanding Design and Outstanding Artistic Creation. I had so many “good feeling” moments as I looked around at our children and saw how engaged and engrossed they were during the performance. 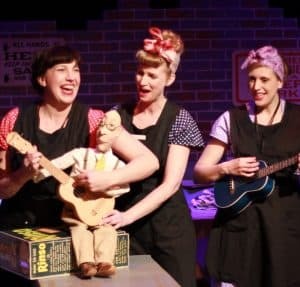 The theatre company’s whimsical and wonderful storytelling features puppetry, singalongs, and an entertaining touch everyone will love.